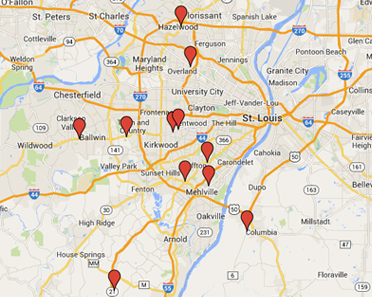 St. Louis Transmission Association is comprised of 8 independent transmission repair shops in and around the St. Louis area for over 40 Years. These 8 shops include Allen Transmission and Austin Transmission. Through our unique warehouse and distribution system we can offer our customers better quality parts, and a wider variety of warranties to better meet the customer's budget. A Diagnostic check-out is the best way to check to see if your transmission is having a problem. Today vehicles are more complex, computer-controlled transmissions; it takes a transmission expert to be able to diagnose a transmission problem correctly. Having the right diagnosis can save you a lot of money and we offer this service free of charge, whereas most places WILL charge you for this service. We do a thorough check out of all vehicles while in our shops. While being checked out we will check your fluids to make sure all levels are good and there is no burnt fluid. Normal fluid is a red with a hint of brown with no burnt odor. Our Services & Amenities Include: FREE Computerized Diagnostic check-outs, FREE estimates, Certified technicians, and Extended and Nationwide Warranties. WE WORK ON CVT & ALLISON TRANSMISSIONS!